Young blood, fresh ideas---these Entrepreneurship students prove that creativity and uniqueness count when establishing a new business. Find out how a simple idea becomes a promising venture for these young ladies. <>Along a street near the University of Santo Tomas (UST) campus is a modest stall that is slowly becoming the talk of the town. It sells juice, which is not your ordinary beverage in a cup. 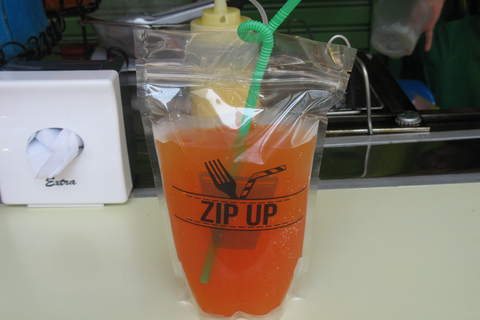 Interestingly, the refreshment is served in a zip lock plastic bag, coming with a comical-looking straw. The idea is simply fascinating for students who come flocking to try what this is all about. 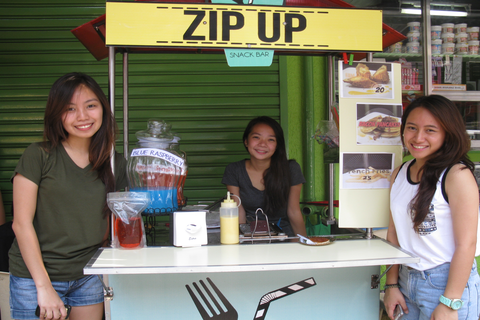 UST Entrepreneurship students Andrea Bernardino, Angela Lirio, and Ivy Policarpio established the Zip Up Snackbar last July as a thesis requirement for their course. But this snack bar was not the original business they had in mind. “Our original business plan was an art café to accommodate ‘artsy’ people. But due to monetary reasons, we had to settle for a much smaller business and so we established Zip Up,” Bernardino reminisced. These three students were searching for unusual ideas across the Internet when they came across the concept of putting beverages inside a zip lock bag. They realized that it was something that has not yet been done by any other business they know. Thus, they instantly grabbed the opportunity to introduce it to the public. To complement their main product, they also developed an extraordinary, but very tasty bacon pancake. “We want something different for our customers. So we thought of mixing bacon and pancakes. Surprisingly it worked for us,” Lirio revealed. The snack bar also serves French fries as well as ham and cheese rolls. Their snacks usually have a life span of about two to three days if refrigerated. The juice takes longer time to spoil as long as it is kept sealed. 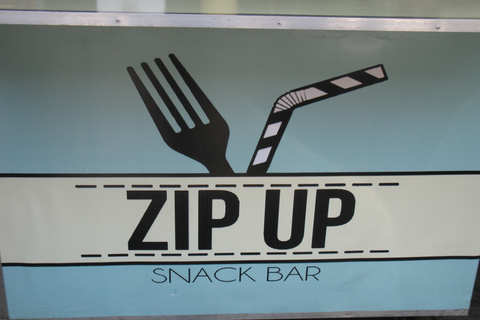 Aside from word-of-mouth advertising, they also used the social media to promote Zip Up. The business has accounts/pages in Facebook, Twitter, and Instagram that customers can follow so they would be regularly updated for the latest offerings and promos. The young entreps are planning to continue the business after graduation. Obviously, they are inspired by the positive feedback from customers. They have already been receiving inquiries for franchising, which they are considering to explore in the future. “Two weeks into the business and we’re already getting inquiries from some people on how to buy a franchise. It’s very overwhelming. We haven’t considered the thought yet, but maybe if everything’s stable for Zip Up, then we’ll entertain the idea,” Bernardino said. They’re also planning to establish their planned art café once they save enough capital from their current business’ earnings. For now, they are planning to start an upgrade by offering more than juices and bacon pancakes. “We’re planning on featuring some pastries for the snack bar. As of now, we’re trying the red velvet cake. It’s a different product, but we’ll still be using the same packaging. We’ll put the cake inside the zip lock bag and see if the customers will like it,” Lirio said.